I have a very pale complexion, yet it seems to be different from most friends of mine which have a pale skin. For example i have no freckles. I do not burn easy in the sun though i do not tan either. I actually need to spend several week outside in southern sun to gain even a tiny bit of tan. My skin is not really white but more slightly olive while been very pale, if that makes sense. As a teenager i hated my pale complexion and yearned for the more tanned looked of my friends. Luckily i grew out of my insecurities and learned to embrace my pale skin. However, foundation brands do not embraced my skin tone quite as much. Most foundations are either to dark or just the wrong tone. When i got my first job and had a bit more money on my hand, i decided to finally find a decent foundation. So i purchased my first Lancôme foundation at 40 euro per bottle (back then my most expensive make up product by far). And well suffice to say, i never looked back. This has been my favourite foundation. It perfectly matches my skin tone, is easy to apply and i do not even feel its presence on my skin. at the same time, it perfectly covers, evens out my skin and gives it a glow. More recently i have been hearing more and more about the Rimmel wake me up foundation and how it is supposedly a perfect drugstore dupe for pricey foundations. At about 10 euro it is about a quarter of the price of my Lancôme foundation. I was intrigued. Unfortunately i could not find it in the store here, so i ordered the lightest shade available online at feel unique. To begin with, the Rimmel foundation does not fit my skin tone perfectly i admit though that i do have a difficult tone to match. However, this foundation works for me. It is not really a lot lighter then my actual skin tone but it is a bit more rosy in the undertone than my skin tone and the Lancome foundation. So instead of imitating my skin tone, it rather changes it but in a way which is not to obvious. Both have had no negative effect on my sensitive skin and are hardly noticeable on the skin. Also both have SPF15 which i love. Even though i do not burn easily, does not mean that my skin cannot get long term damage from the sun. 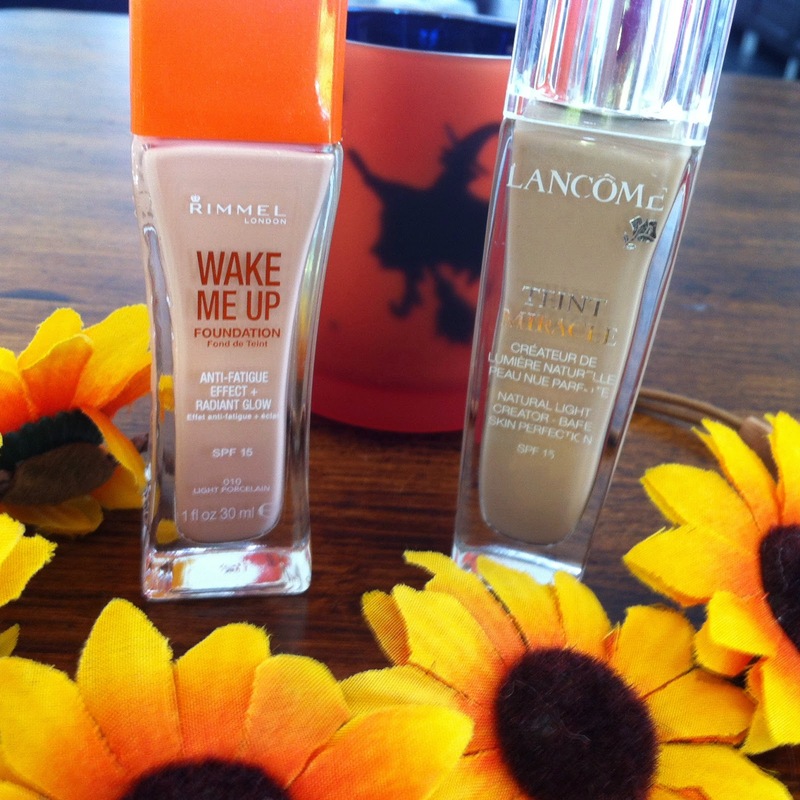 As far as the lasting power goes, i have to say that i am impressed by the Rimmel wake me up foundation since i could not find any difference to the Lancome foundation and that at a fraction of the price. Consistency wise the Rimmel foundation is a bit more creamy than the Lancôme one and is a bit more difficult to apply evenly. However, with a bit extra buffing, this is easily fixed. The Rimmel foundation does give a nice even complexion and a a healthy hue, however, it does not give the magical glow i achieve with the Lancome foundation. So my final conclusion: I will keep buying my Lancôme foundations since it is just the best match far and because of this magical glow i looove. Saying that, i do not regret buying the Rimmel Wake me up foundation. It is a very good foundation and can easily hold up with higher priced foundations. Actually i now switch a bit between both since it also makes my Lancôme foundation last longer.